It was with great reluctance this week that I cut back the lavender plant by our front walk. All summer I've enjoyed it's bounty! This year it's grown to a diameter of more than 5' and is nearly as tall when you count the stems and buds. After the initial bloom of lavender in June, the buds should be cut off, making way for new blossoms in the later summer. Although the late lavender blossoms are not quite as prolific, the result is still a nice crop of lavender. Before winter arrives, it is a good idea to cut off all the old lavender blossoms and to prune the plants back so that they have only 2 or 3 inches green above the woody stem or branch. So, this week --- was lavender trimming week! Most of the lavender plants have been trimmed into rounded mounds. It is nice to go into winter having them look so manicured. Their silvery foilage is pretty, and each variety is a little different shade from the other. Of course, it wouldn't be a good idea to 'waste' any of the lavender blossoms that were cut. So, a bouquet has been gathered and placed in a crystal vase that's on the counter in the bathroom, adorned with a gray and sage striped ribbon. And the freshest and most purple was added to a kettle of honey. 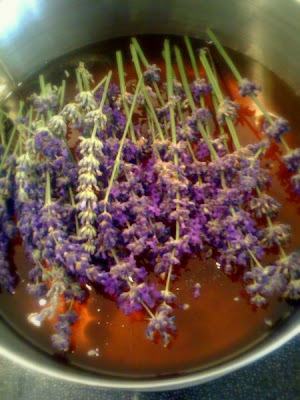 It was heated so the flavors could meld, and then allowed to cool into a fragrant and delicious 'lavender honey' for winter's use. I always, always miss the lavender during the winter months. There is something so fragrant and soothing about it's fragrance --- and it's soft beautiful blossom always makes me smile! Until next June, sweet lavender. . .
Oh my gosh I had no idea that lavendar would grow this big...beautiful! Oh my goodness! Your outdoor space is just so beautiful. I too am a big fan of lavendar. I would love to have more of it growing around here. There is a big bush of it that grows by our mailbox. I like to make lavandar wands out of it. They look so pretty and smell so heavenly. Would love to try the lavendar and honey thing. You inspire me to go prune my lavender and simmer with some honey.